When we think of gym flooring, the image of a hardwood gym floor may come to mind for many of us as we have all gone to PE classes and prep rallies on a floor like this at our high school gym. 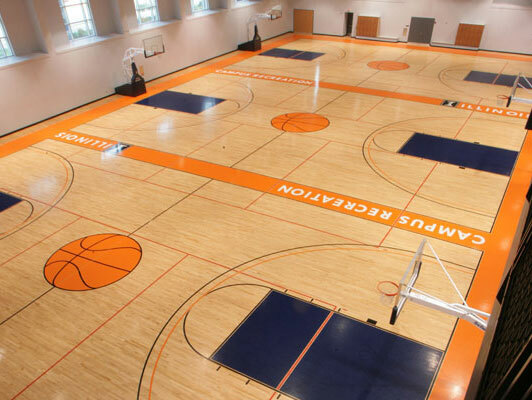 While many gym floors are made out of other materials, the hardwood gym floor is a classic image associated with popular sports such as basketball and volleyball and it is still widely in use in schools and public gyms. Hardwood gym flooring is built to withstand heavy use from sports but these floors do need to be regularly cleaned to maintain their look and longevity. The following are gym floor maintenance tips that are effective for cleaning and restoring hardwood gym flooring. Wood gym flooring has a layer of finish on the surface that can get ruined by harsh cleaning products. It is best to use a neutral, low detergent cleaner for cleaning wood gym floors and limit the use of other cleaning products so you do not damage the finish. Wet cleaning is important for gym floor maintenance because sweat from the athletes builds up on the floor over time, leaving behind a slippery film of salt and protein. The resulting film can be dangerous because athletes are more likely to hurt themselves on a slippery gym floor. It takes the right wood floor cleaner along with mopping or scrubbing to effectively remove this film from the floor. While mopping is still an effective way to clean a hardwood gym floor, automatic scrubbers are much more efficient. Automatic scrubbers use a variety of pads and brushes to scrub the surface of the gym floor and they also have a built in vacuum system that removes the water. These machines can cover entire gym floors very quickly and you do not have to worry about excess moisture warping the wood gym flooring. Hardwood gym floors are pretty resilient but there are some things that can damage the surface of the floor such as chairs and heavy equipment with metal or plastic casters. The best way to protect the gym floor is to establish rules that forbid objects that could ruin the floor and there are also floor covers available that can cover and protect wood gym flooring. Hardwood gym flooring gathers dust that can cause it to feel slippery, making it important to regularly remove the dust. However, using a traditional dust mop on a gym floor is counterproductive because it does not hold dust very well and requires a treatment that could leave a residue on the floor. Microfiber dust mops are the best option because they effectively hold the dust without the need for treatments or other cleaning products. Cleaning a hardwood gym floor is not only important for maintaining its appearance, but also for keeping the gym floor safe by removing dust and perspiration that could make the floor slippery. Therefore, a clean gym floor will reflect better on your school or facility and provide a much safer venue for athletes. You can get cleaning products that are safe and effective for hardwood gym flooring from professionals that provide sports flooring installation and maintenance products.